Welcome to Amsterdam, a fascinating 700-year-old city of picturesque canals, world class museums, theatres and cafés. You will be met and transferred from the airport to your Emerald Waterways luxury river cruise ship. After boarding, enjoy some time at your leisure to explore Amsterdam. This evening, join your fellow travellers for dinner on board. This morning you can decide to either enjoy a glass top canal boat tour through Amsterdam’s canal or a guided bike tour. Return to the ship for your first day sailing through the Dutch countryside passing windmills and sailing through locks towards the Rhine River. Tonight, the Captain will be delighted to host a gala dinner. Founded by the Romans, and one of Germany’s oldest cities, Cologne is famous for its magnificent World–Heritage listed Gothic Cathedral. Join your guide and explore the city including the Old Town. During your free time shop for handicrafts or visit a local market before returning to your ship. Today’s cruising will be a highlight of your trip, as we cruise through the spectacular Rhine Gorge. Keep your camera at the ready as around every bend there are stunning vistas of castles perched above steep vine–covered slopes. We will also pass the infamous Lorelei Rock where sailors are said to have been lured onto treacherous rocks by enchanted temptresses. We also pass the impressive Pfalzgrafenstein Castle which was formerly a toll gate perched on an island in the middle of the river. In the afternoon we arrive in Rüdesheim, one of Germany’s most popular towns. You will either have a choice of visiting the Siegfried’s Mechanical Musical Instrument Museum or if you feel active take a guided hike through vineyards. Continue exploring, and perhaps taste the famous “Rüdesheimer Coffee”, made with Germany’s most famous brandy Asbach Uralt. Known as the “Pearl of the Romantic Road”, Würzburg is surrounded by sloping hills covered with vineyards. After breakfast, visit the Bishops’ Residenz, one of Germany’s largest and most ornate baroque palaces and a UNESCO World Heritage Site. Your tour highlights the palace’s unique staircase, elaborate 18th century frescoes and the amazing 3–dimensional stuccowork. Relax on board this morning as we cruise to Bamberg. Feel the magic of the past as you explore this UNESCO World Heritage city with your guide. Boasting one of Europe’s largest intact medieval town centres, Bamberg is bursting with character and charm. At the town centre is the largest preserved old quarter in Europe. Around 2,400 listed buildings and the centuries–old garden quarter form a special cultural heritage. Admire hundreds of building façades richly decorated in fascinating detail with spectacular ornamentation. Today you will have a sightseeing coach tour of the historic city of Nuremberg. Your coach tour would pass by some of the historical parts of Nuremberg, such as the 900-year-old ramparts, the Nazi party rally grounds, where rallies were held from 1933 until 1938 among other sights. 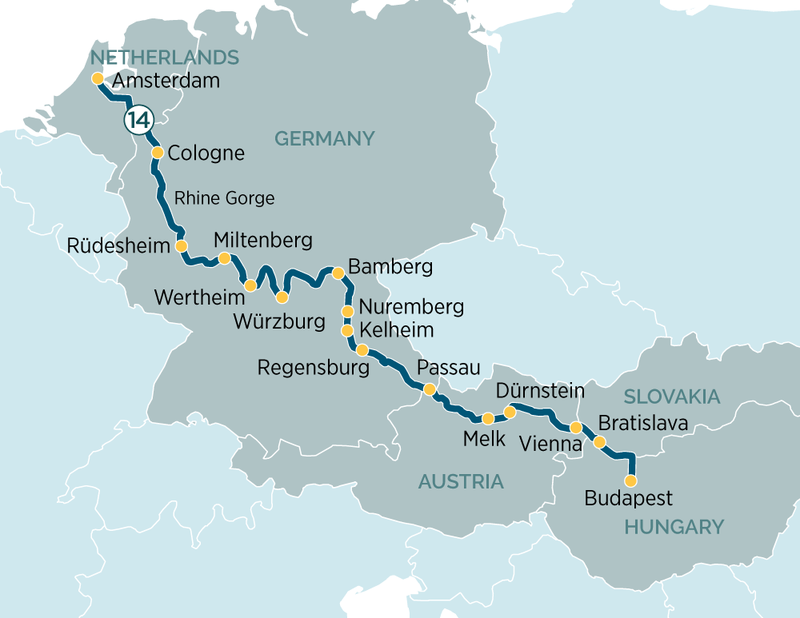 This morning takes you through the final stretch of the fascinating Main–Danube Canal to Kelheim. Continue cruising along the Danube River to Regensburg, one of Germany’s best preserved medieval cities. On our guided walking tour, you will have the chance to see one of the oldest bridges crossing the Danube and see the city’s architectural highlights including the Old Town Hall. Welcome to Vienna, the capital of classical music. Today, you have a choice of either exploring Austria’s capital beginning with a drive along the magnificent Ringstrasse, where we will see the sights of the Vienna’s world-famous attractions such as the Opera House, Burgtheater, Town Hall, St. Stephen’s Cathedral and the Hofburg Imperial Palace. If you feel active, join the guided bike tour instead of the drive around and guided walk. Set on the crossroads of ancient trade routes in the heart of Europe, Bratislava the capital of Slovakia, embodies various cultures – primarily Celtic, Roman and Slavic. Enjoy a sightseeing tour including the enchanting Old City with its Town Hall, Mirbach Palace and the Gothic Cathedral of St Martin. Alternatively, join an active hike to Bratislava Castle. Budapest is Eastern Europe’s liveliest and most cosmopolitan city. Enjoy a guided tour of the city sights including the Hungarian Parliament Building, the Buda Castle and the Chain Bridge linking Buda and Pest or an exciting hike on the Buda Hill. This evening, enjoy a traditional Hungarian farewell dinner, then a Hungarian folk dancing and music performance on board.